It’s that time again and we’ll be reviewing Episode 1 of Game of Thrones with History of Westeros this week! Find it on their platforms (YouTube and iTunes) or go to our GoT coverage page for links to individual episodes. We’re looking forward to seeing what the next seven weeks has to bring and sharing our thoughts with you all. Valar Dohaeris! 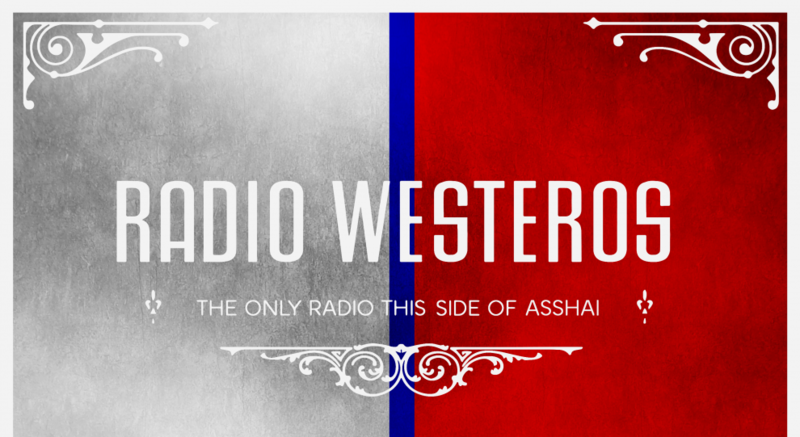 This entry was posted in Guest Appearances, Radio Westeros and tagged Game of Thrones, History of Westeros. Bookmark the permalink. Just started listening to the podcast today and it was great to get some different perspectives on the new episode. One of you said something about what lessons Sansa might have learned from Cersei. I’m rewatching season two and when the ladies are all holed up during the battle of the blackwater, cersei goes on about how she wouldn’t be able to seduce stannis and tells Sansa that tears aren’t a woman’s only weapon, “the best one is between your legs. Use it.” Sansa hasn’t really been sexualized in the show besides her abuse by ramsay, it made me wonder if she might be thinking now about how her sexuality could be used to benefit her. Or potentially to manipulate littlefinger. Just a thought. Anyway, thanks for making the show! Can’t wait to listen after the rest of the episodes air! That’s a great point! It’s something we expect to see in the books, but absolutely possible we something similar in show. Thanks for listening and commenting! Stannis to Mel: You’ve slaughtered many lambs. Mel to Stannis: And none have seen the blade. Olenna to Dany: Are you a sheep? Mel to Dany: You should meet Jon Snow. Mel introduces NN to AAR… just sayin’. Will we get an Arya vs Jon skirmish? I honestly am not as hooked with GOT as a lot of people are but my boyfriend is a huge fan of GOT. He keeps on bugging me to watch the series for quite some time already. He told me that the next season may be the best there is and because of that I am truly intrigued and may find time to finally see them and be part of the phenomenon.